You’ve sneaked yourself onto a party of tourists being shown over Windsor Castle. You’ve tagged along, gawking at the grandeur, until you reach a back corridor signposted “Archives”, whose private rooms are cordoned off by ropes. The guide and her group are disappearing round the next corner and as her voice fades, you duck under the cordon and enter an ancient office, dusty and deserted. In the corner stands an antique bureau, once regal but now tarnished and pensioned off. You idly turn the key and open the lid of the writing desk. It is empty but for a small cardboard box, sealed with a label that reads “In NO circumstances to be made public”, in a faded copperplate hand. You open the box and . . .
I’ve made this journey in imagination many times. I feel I know the contents of that imaginary box intimately. I believe in its existence so strongly I’ve even dreamed of booking a tour of the castle myself with the intention of nipping under the barriers if the opportunity arose. The reason for my obsession is that I’m convinced the box contains an explosive royal secret. Most of us know perfectly well that the British royal family is German by descent. But I wonder how many realise just how German Queen Victoria was? Pure German blood flowed in her Hanoverian veins from both sides of the family. Her grandfather was King George III, and her father, Prince Edward, Duke of Kent, George’s fourth son. Her mother was Victoria of Saxe-Coburg-Saalfeld, a German princess. As a small child, Victoria was looked after and taught by her German governess, Baroness Lehzen. For the first three years of her life, she spoke only German. When she met Albert at 17 they spoke German together and even when his English gradually improved, they continued to use their native tongue when together. If you had visited Buckingham Palace at any time in the later part of the nineteenth century you would have found German being spoken. We know that at one stage, Victoria had a German accent and that tutors were hired to eradicate it. What we do not know is how successful these tutors were and to what extent the accent was eliminated. None of this would have mattered at all had it not been for the fact that in 1878 Thomas Edison invented his machine for recording and replaying sound with a fair degree of fidelity. By 1880 the technology had improved so that music and voice could be reliably recorded onto wax cylinders for mass reproduction and sale to a public eager to hear the voices of the famous. To publicise the Phonograph, Edison persuaded eminent people to record wax cylinders, tempting them with the idea of vocal immortality. Among the most famous surviving voices that he lured in front of the speaking trumpet were those of Alfred Lord Tennyson, delivering his Charge of the Light Brigade, Robert Browning, Sarah Bernhardt, Florence Nightingale and Arthur Conan Doyle. He was also successful at persuading statesmen and crowned heads to record: presidents Teddy Roosevelt and Woodrow Wilson, as well as Tsar Nicholas II and Kaiser Wilhelm II. In 1888, Edison’s phonograph came to Britain and was exhibited at the Crystal Palace amusement park where it attracted much attention including that of Prime Minister William Gladstone, who recorded his voice. Edison sent several messages to the Queen inviting her to make a recording, but she politely declined. Despite her reticence, we know of at least two occasions when Victoria did record her voice. The first was in the Autumn of 1888, when a lawyer named Sydney Morse visited Balmoral. Morse handled the legal affairs of the British end of the Graphophone company – a rival to Edison founded by Alexander Graham Bell. He was a close friend of one of the ladies of Victoria’s court and took a machine and several cylinders to Scotland. It is said that the Queen spoke a few words into Morse’s machine. The wax cylinder from that visit was tracked down in 1991 to the archives of the Science Museum, to whom it had been bequeathed in the 1920s. Attempts have been made to recover the recording digitally but it has been so distorted by repeated playing that almost nothing remains except vague noises. It is also not certain that the voice it contains is that of the Queen – it might equally be of one of her ladies in waiting. The second occasion is more promising. In August 1898, the Foreign Office wished to make an impression on the new modernising Emperor of Ethiopia, Menelik II. They persuaded the queen to record a message of congratulation on a wax cylinder. Victoria agreed but on condition that the cylinder be destroyed after it had been played to the Emperor. The Emperor was so impressed at hearing the queen’s voice that he recorded two wax cylinders in reply, and these replies are today in the royal archives at Windsor. The queen’s message was returned to the British ambassador in Ethiopia as arranged, but did he, in fact have the courage to destroy the voice of Her Britannic Majesty? Or did he return the cylinder to the Foreign Office in London? The fate of this cylinder is unknown. If it did survive, it could have been political dynamite. Recordings can emphasise every peculiarity of speech, especially as they can be studied over and over. Even a slightly unusual accent stands out – especially a foreign accent and especially the instantly recognisable German tongue. The slightest trace of a German accent could have been dangerous for the monarchy at a time of rising tension with the newly-powerful Germany. Despite her strait-laced image, Victoria was an enthusiastic early adopter of technical innovation. She used the new art of photography almost from its infancy. Photography was invented in 1839 and by 1840 she was sitting for royal portraits. In 1860 she agreed to have her portrait photograph published and sold in the then fashionable format of a visiting card, so that people could own a photographic portrait of their queen. 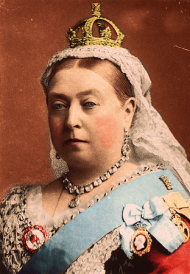 There is every likelihood that Victoria’s family and advisers suggested that having a recording of the Queen’s voice would cement her link to her people even more positively – but not if it would betray her German origins. My imaginary box in its imaginary bureau contains a simple wax cylinder, with a few words from one of the most famous women who ever lived, and whose voice we never heard. But it could change forever our perception of the most British of British monarchs. Having watched Victoria on itv I wonder whether Prince Albert really spoke English with that strong German accent? Like you, I’ve watched the ITV series and wondered about its accuracy of detail. From my reading I’d say that the series is aimed primarily at enterntainment (filling the Downton Abbey, Sunday Soap-opera slot) rather than accuracy. We do know that Albert had a German accent that he worked hard to get rid of it. We also know that inside the palace, German was spoken most of the time between Victoria and Albert, and between Victoria and Lehzen and her other German courtiers, of which there were a number. On the other hand, there was very little of the anti-German feeling depicted against him in the series and Albert was often cheered by crowds when he appeared in public. The accent of Albert in this series is a fake German one. In episode 4 he speaks of “Waldeinsamkeit” which is not used by Germans, may they be princes or not. And he pronounces this in a way that I had to listen twice to understand what he actually said. The real Albert would have meant “die Einsamkeit des Waldes” which means the solitude of the forest. Aside from such minor things like Lord Melbourne was in his 60ties instead of his 40ties it is an entertaining show. And yes, Victoria did have a German accent. (One of my great grand aunts was at her court and it was a family anecdote that Drina couldn’t master certain Shibboleths) And why not? Anyone with an accent is able to speak at least one other language. The anti-German campaign in England and places like Australia stems from the First World War – and Victoria had already been interred for almost 15 years. (Renaming of the House of Windsor, Mountbatten or various places Down Under) . In fact this Austrian idiot painter turned Gröfaz believed that the British would join his madness of fighting the “Bolshevik untermensch ” -quite glad they didn’t. Otherwise we would have too walk in goose steps and grow funny moustaches. for a walk around Kensington gardens, on my return i would receive payment and a large bowl of ice cream. Eeating, wilst being told the repetitive stories of her time as a young woman at the palace . Mentioning that when she did hear the Queen speak certain words had an accent, particularity if annoyed.